Yesterday we showed up in force at over 100 Congressional offices to demand our representatives stand with our generation and support Ocasio’s Select Committee on a Green New Deal. That’s the biggest day of action ever for Sunrise, and the culmination of one of the most exciting - and overwhelming - weeks I’ve ever had in this movement. Now, we need to turn this burst of energy into a lasting network that can put pressure on every single member of Congress. 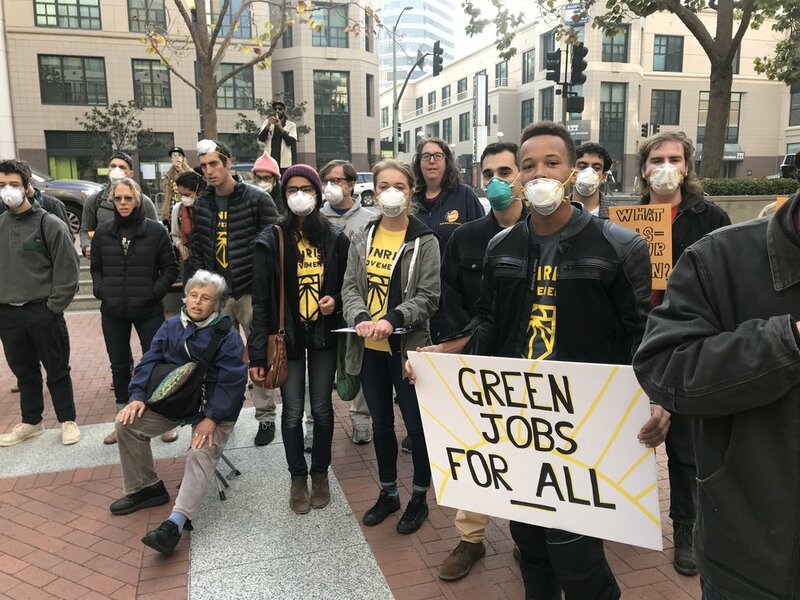 Join our Green New Deal campaign call on Tuesday 11/27 at 8pm EST; we’ll take on the next steps to keep up our momentum and make sure we get the support we need from Congress to make the Select Committee for a Green New Deal a reality. There were so many inspiring stories from yesterday. I want to share just a few. In Oakland, CA, over 75 young people visited Rep. Barbara Lee and Rep. Nancy Pelosi’s California offices. They wore masks to protect them from air pollution caused by forest fires, which has made the Bay Area have some of the worst air quality in the world. In Rhode Island, young people broke into song to disrupt DNC chair Tom Perez while he spoke on a Brown University panel, demanding he and the Democratic Leadership endorse the Green New Deal and reject money from fossil fuel executives and lobbyists. 12 year old Haven Coleman was the youngest action organizer. She brought over 30 people (including many younger than her!) to Rep. Diana DeGette’s office to powerfully demand she support the resolution. We saw our pressure working before our eyes. At two of the offices we visited, Rep. Ted Lieu in California and Rep. Ilhan Omar in Minnesota, we got new commitments from them to support the resolution. Last week, Rep. Peter Defazio of Oregon said he opposed the resolution. Yesterday, he told us he would “support any committee that would implement bold new ideas to address the threat of climate climate change head-on.” Our new Eugene hub will be keeping up the pressure on him. I don’t know what fossil fuel lobbyists usually talk about over Thanksgiving dinner, but I bet that this year, it’s going to be us. They’re going to push back hard, and to hold our ground, we need to prepare now. Can't make the call? Help us continue this important work through 2019. Start a monthly donation of $10 or more, and we’ll send you a Sunrise t-shirt to say thanks. Two weeks ago, the Green New Deal was a little-known policy proposal. Because of our movement, some of the most powerful people in Washington are considering making it a top priority for Congress, and we’re gaining more support each day. To sum it up: in just the last week, 12 US Representatives have endorsed our resolution, 76 organizations have signed on, and 12,000 young people have joined our movement. We’ve been in nearly every major national media outlet, millions of people are watching our livestreams on social media, and green jobs for all is now a serious policy idea. The past year of climate disasters has taken it out of all of us. It’s hard to stay focused some days. But these past two weeks have made me believe that anything is possible, and we can win. PS. Building on this momentum will take resources. That’s why from now until Tuesday 11/27, Sunrise is offering to send one of our new Sunrise t-shirts to anyone who begins a monthly donation of $10 or more. Chip in today.